Once our hosts made it completely clear that we were most welcome in their Asaro tourist village, they brought out their mudmen to scare the begeezus out of us. 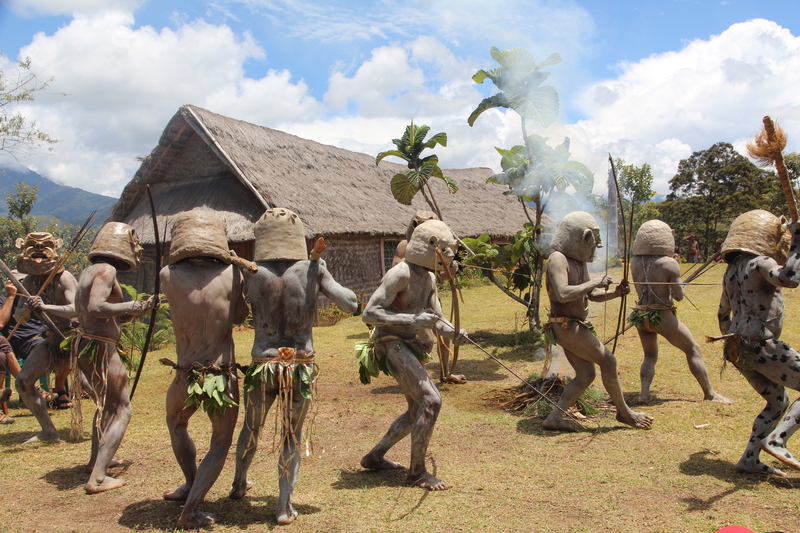 Of course, having seen the mudmen at Papua New Guinea’s Goroka Show and knowing a bit about their background, we all felt reasonably unthreatened. Most of the history of mudmen is based on legend. The story goes that Asaro villagers were defeated by an enemy tribe and forced to flee and hide in the Asaro River until nightfall when they could attempt an escape. By chance, when the villagers rose from the riverbanks in the evening mist, their bodies were so covered in mud that the enemy mistook them for spirits. 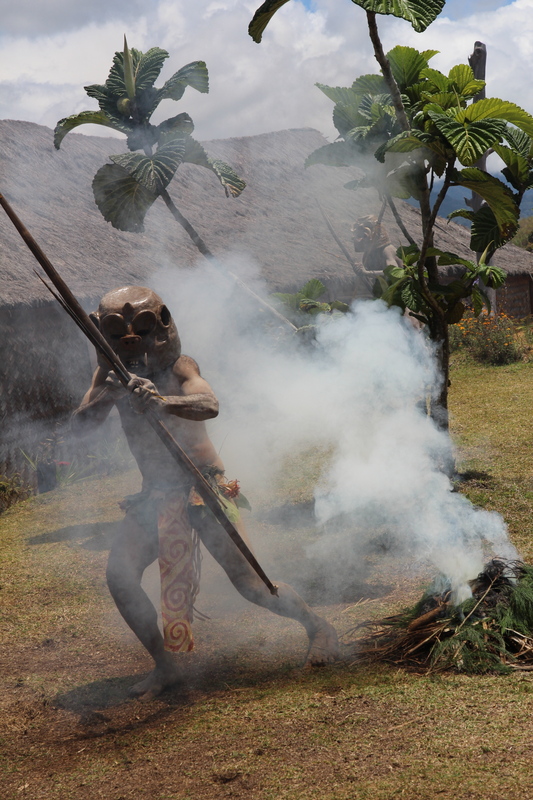 Most tribes in Papua New Guinea are terrified of spirits, so the enemies ran off, and the Asaro escaped to their own village. Some of the enemy tribesmen were still lurking in the Asaro village, and when the ‘spirits’ returned ‘home’ the invaders assumed they were being counter-invaded, so fled back to their own village. Ever since the Asaro have continued to use this dusky illusion to ward off their enemies (or entertain visitors). The big difference is the addition of masks. Legend says the mud of the Asaro River is poisonous, so instead of covering their faces with the mud, the Asaro make fearsome masks using homemade clay. So all this background leads us to the mudmen ‘dance’ put on for our group. 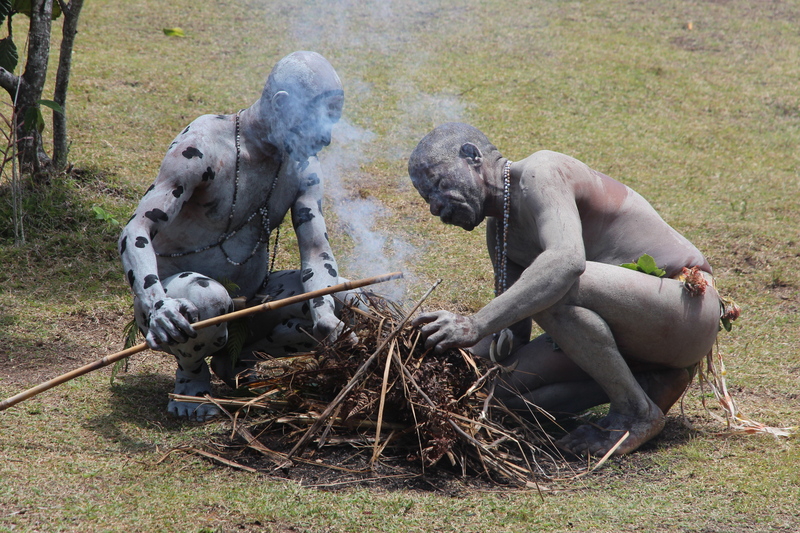 Because our mudman performance took place in the middle of the day, our hosts decided to light a fire to create a bit of mystery and artificial mist. The actual fire-making process was rather embarrassing for our hosts and totally hilarious for us. They tried and tried and tried to get the dry grass going using traditional fire-making techniques, but nothing worked. In the end, everyone was laughing and the fire builders accepted the offer of a cigarette lighter to do the job. Then enter the mudmen. They weren’t hugely scary, but when they lunge at you with a spear, you do jump a bit. Ask Poor John who was one of their first ‘targets’. I was lucky enough to see them getting ready down near Poor John’s and my hut, so noticed the good humour and enthusiasm they showed before employing their ‘scare’ tactics. After the performance the main, and supposedly scariest, mudman removed his mask so we could see his soot-striped face, and feel and hold his homemade mask. Those darn things weigh almost 10 kilos (22 pounds). Can you imagine jumping around in one of those? It really was amazing to see. 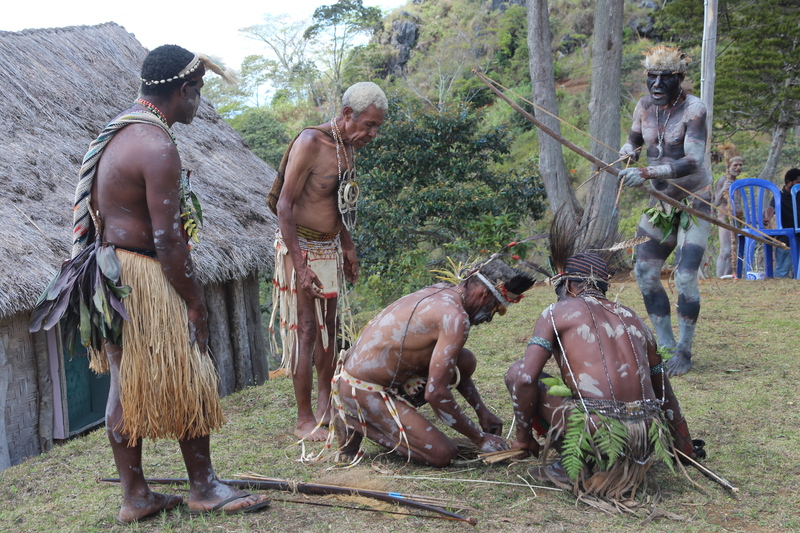 New Guinea is definitely on my must visit list now, the photos and stories from there are amazing. Highly recommended! Hope you get there soon. 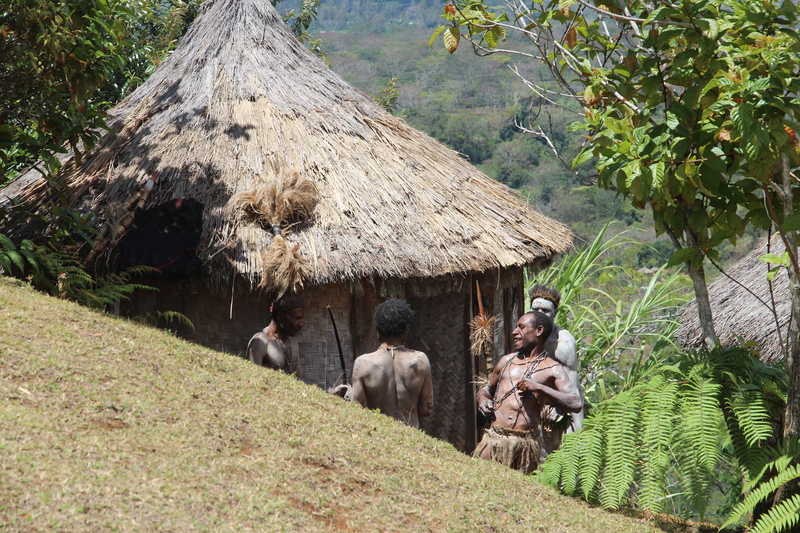 Spiritual beliefs are indeed a big thing in PNG. Several villages gave us demonstrations of customs, and it was quite easy to see the spiritual undercurrent. http://kyuhoshi.wordpress.com/2014/11/29/10-best-japanese-cookbooks/ Icouldn’t remember the name of your cooking blog, so I’ll ask you the question here: Have you seen this blog or this listing of Japanese cookbooks? Thanks so much. I don’t own any of those but I may soon. 🙂 And here’s a link to the cooking blog. WOW that’s stunning!! Few months ago I started learning new things about papua and since then I can’t wait to travel there. I recommend you this doc https://vimeo.com/51548963, it is interesting and sometimes fun. Thanks for the link. I have seen this video before and it is excellent. YOU GUYS ARE SO AWESOME!! !ESPECIALLY HOW U GUYS DANCE…. Thanks so much. The mudmen really have amazing moves. Oh wait, hang on! Is this one of your family reunions, or one of mine? Or are we related? Oh wait, I probably already know the answer—you lucky duck!